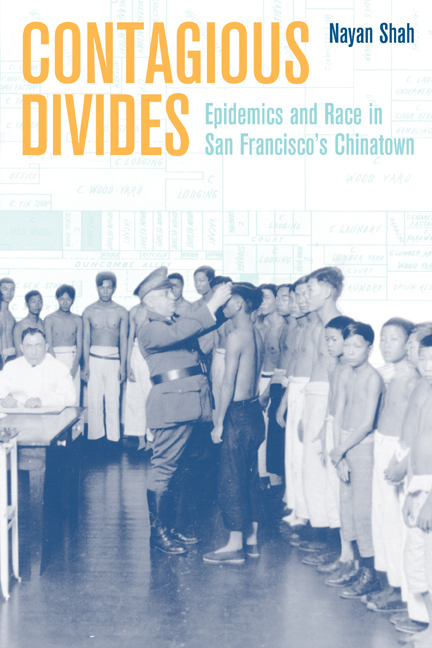 Contagious Divides charts the dynamic transformation of representations of Chinese immigrants from medical menace in the nineteenth century to model citizen in the mid-twentieth century. Examining the cultural politics of public health and Chinese immigration in San Francisco, this book looks at the history of racial formation in the U.S. by focusing on the development of public health bureaucracies. Nayan Shah notes how the production of Chinese difference and white, heterosexual norms in public health policy affected social lives, politics, and cultural expression. Public health authorities depicted Chinese immigrants as filthy and diseased, as the carriers of such incurable afflictions as smallpox, syphilis, and bubonic plague. This resulted in the vociferous enforcement of sanitary regulations on the Chinese community. But the authorities did more than demon-ize the Chinese; they also marshaled civic resources that promoted sewer construction, vaccination programs, and public health management. Shah shows how Chinese Americans responded to health regulations and allegations with persuasive political speeches, lawsuits, boycotts, violent protests, and poems. Chinese American activists drew upon public health strategies in their advocacy for health services and public housing. Adroitly employing discourses of race and health, these activists argued that Chinese Americans were worthy and deserving of sharing in the resources of American society.